I recently modified a Ruger Redhawk chambered in .45 Colt to also fire .45 ACP by milling the ejector star (refer to my article Converting a KRH .45 LC Redhawk to shoot .45LC and .45ACP). Now I wanted to perform an action job on this revolver. An action job consists of polishing all of the action parts where they make contact to reduce friction and make the action smoother. Certain angles and surfaces can also be modified to make the trigger pull heavier or lighter. I had already polished out some burrs in the frame where the hammer and trigger were rubbing, so now I was ready to work on the action parts themselves. Just a brief note about polishing – I constantly read that when polishing you don’t want to remove any metal, just polish the surfaces. Polishing, by its very nature, removes a very small amount of metal to make the surfaces smooth. This usually involves removing burrs or high spots, but not deep pits or tooling marks unless absolutely necessary. The goal is not to remove so much metal as to change the angles or dimensions of the parts. I viewed a number of videos on You Tube to get some ideas on how to perform an action job on the Ruger Redhawk, Super Redhawk, GP100, and SP101 which all have essentially the same action, but most were incomplete, and a couple are just downright wrong. 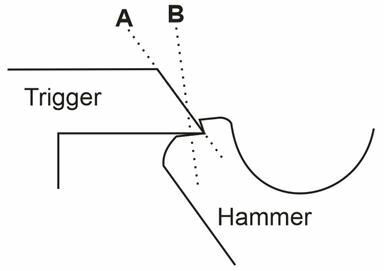 Before polishing any surfaces, I wanted to get an idea of how the hammer and trigger interacted in both single-action and double-action modes so I could determine the surfaces that would need polishing. I used a bench block and drilled two holes to hold the trigger and hammer pivot pins. I also drilled a 1/16” hole for a roll pin to keep the hammer from moving too far forward, which simulated the frame. I removed the pawl and transfer bar for clarity. The placement of the holes may not be perfect, but they were close enough so I could see what parts were touching during both the single-action and double-action cycles. With the hammer and trigger at rest, the mainspring holds the hammer against the frame and also holds the trigger forward. Note how the trigger hook is between the hammer dog and hammer hook. The Redhawk uses one spring as both the hammer mainspring and trigger return spring. This is one reason why the single-action trigger pull on a Redhawk is so heavy. Pressing the trigger to the rear begins the double-action cycle. 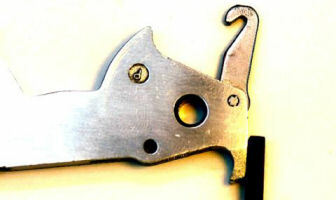 The top of the trigger hook presses on the bottom of the hammer dog causing the hammer to begin to rotate. These two surfaces need to be polished and lubricated. At the same time as the trigger begins to move, the cylinder bolt drops down to unlock the cylinder, the pawl rises up to engage the cylinder ratchet to rotate the cylinder, and the transfer bar begins to rise up to cover the rear of the firing pin. These parts are not shown but also need to be polished to eliminate any friction. 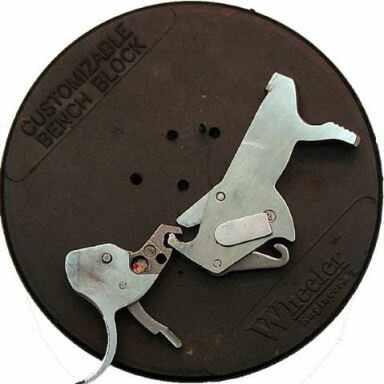 As the trigger is continued to be pressed to the rear, the hammer movement is transferred from the top of the trigger hook and the hammer dog to the bottom of the hammer and the double-action sear on the trigger. These two surfaces will also need to be polished and lubricated. The point of the double-action sear needs to be gently rounded so it won’t gouge the bottom of the hammer. The cylinder bolt is released and a spring and plunger causes it to pop up and rub against the cylinder creating a drag ring. The pawl continues to rise causing the cylinder to continue to rotate, and the transfer bar also continues to rise. In the final stage of the double-action cycle, the trigger has been pressed to the point where the double-action sear is just ready to release the hammer. As the trigger continues to move to the rear the sear releases the hammer and the hammer falls. These surfaces need to be polished and lubricated, but the angles should not be changed. Just before the hammer falls, the cylinder has been rotated enough that the bolt falls into a bolt notch in the cylinder which locks the cylinder in place, and the transfer bar is high enough to engage the rear of the firing pin. 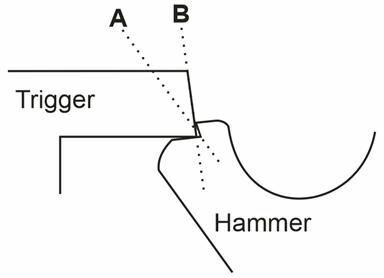 Releasing the trigger after the hammer falls causes the single-action sear on the trigger to depress the hammer dog. As the trigger moves forward the single-action sear presses on the hammer dog causing the dog to rotate. 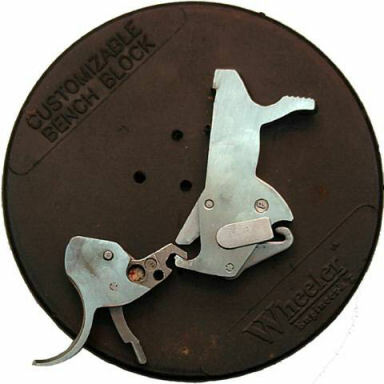 When the single-action sear on the trigger clears the end of the hammer dog, a spring and plunger behind the hammer dog causes the hammer dog to pivot to the front thereby resetting the action. Again, where surfaces meet and rub together, they need to be polished and lubricated. As the trigger moves forward, the pawl and transfer bar are lowered to their reset positions. 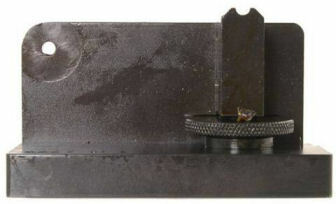 Nestled inside the trigger assembly are the cylinder bolt and the trigger plunger. The trigger plunger causes the bolt to rotate down which unlocks and releases the cylinder. When the trigger is released and moves forward, the angled front of the trigger plunger rides against a cam on the rear of the bolt causing it to move backwards. The end of the spring for the pawl plunger also rides against the rear of the trigger plunger and causes it to move forward and slide over the bolt cam in preparation to rotate the bolt at the beginning of the next cycle. The engagement surfaces on these two parts need to be lightly polished where shown. Over-polishing these two parts will affect the timing of the bolt. The sides of the bolt and trigger plunger can also be lightly polished; just enough to remove roughness and high spots, but not mirror smooth or the dimensions will be changed. All surfaces that touch need to be cleaned and lubricated after polishing. To begin the single-action cycle the hammer is pulled to the rear. 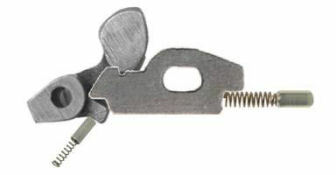 The top of the single-action hammer hook presses against the underside of the trigger which causes the trigger to begin moving to the rear. The underside of the single-action sear on the trigger, and top surface of the single-action notch on the hammer need to be polished and lubricated. 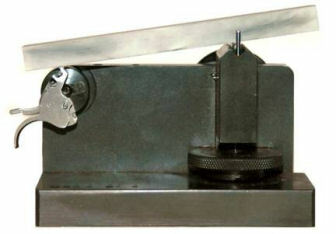 As before, when the trigger begins to move, the bolt falls unlocking the cylinder, the pawl and transfer bar begin to rise and the cylinder begins to rotate. As the hammer continues to be pulled to the rear, the single-action sear on the trigger falls into the single-action notch on the hammer. Mainspring pressure holds the hammer notch against the trigger sear. When the trigger is pulled, the sear moves out of the notch allowing the hammer to fall. The ledge of the single-action notch on the hammer can be reduced to remove single-action drag, and the sear and notch need to be polished glass-smooth. When the trigger is pressed, the single-action sear moves out of the single-action notch and the hammer falls. When the trigger is released the action resets. It is important to note that the hammer comes back farther in single-action mode (shown in blue in the above photo) than in double-action mode. That means the hammer has less striking force against the firing pin in double-action mode. When I replace a mainspring I always test with CCI primers to see if they will fire in double-action mode. CCI primers are the hardest in the industry, and the hammer has less energy in double-action mode. · 400 and 600-grit narrow polishing sticks – available from Boride Engineered Abrasives. They make a gunsmithing kit with coarse and fine, wide and narrow polishing sticks that I have used on many guns. Oil is used to clean these polishing sticks. · Fine Arkansas stone – available from Brownells. 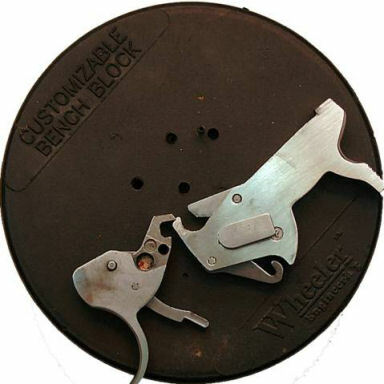 They make a 4-stone set #975-104-000 that comes in different shapes perfect for gunsmithing use. Oil is used to clean these stones. · Power Custom Series I Stoning Fixture – The proper tool for polishing the trigger sear. 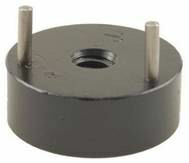 Available from MidwayUSA.com, #743549, this jig ensures that surfaces are kept flat and square. 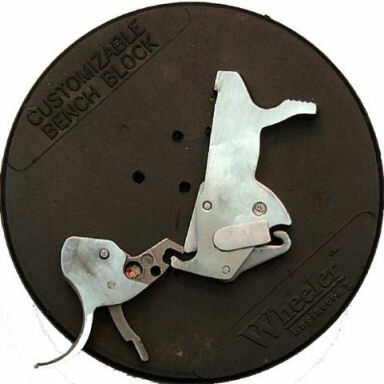 · Ruger Redhawk Adapter for Power Custom Series I Stoning Fixture – This adapter fits the Series I stoning fixture and sets the Ruger Redhawk trigger in the proper position so the single-action sear can be polished. This is also available from MidwayUSA.com, #335275. 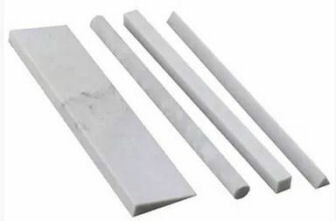 · Ceramic Polishing Sticks, White, Extra Fine – Available from Brownells #080-721-601 used to polish the single-action sear. Water is used to clean a ceramic stick. I installed the Redhawk adapter onto the Power Custom Series I stoning fixture. I removed the pawl and plunger and the trigger plunger from the trigger and mounted it onto the adapter. I marked the sear with a blue marker to ensure I was polishing the surface flat. I used the white extra-fine ceramic stick to polish the surface. When the stick became dirty I used water to clean it. It is possible to change the angle of the single-action sear to increase or decrease the single-action trigger pull. A small change in angle goes a long way so must be done very carefully in very small increments. The Power Custom Series I stoning fixture is designed so that moving the adjustment wheel changes the angle of the stone against the sear. Changing in the direction of angle A will make the trigger pull heavier. In this situation the trigger is actually causing the hammer to rotate which is called “hammer push” which results in a heavy trigger pull. Notice the gap between the sear and the hammer notch. Changing in the direction of angle B will make the trigger pull lighter. If this angle is too large the hammer could slip off of the sear causing a very unsafe condition. I decided not to change the angle in any way on my revolver. 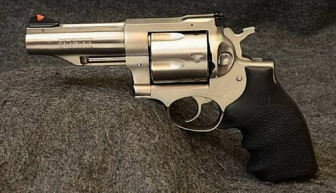 I certainly didn’t want to make the single-action trigger pull any heavier than it already was, and I didn’t want to risk making the revolver unsafe; especially since I reduced the height of the single-action notch on the hammer. The single-action trigger pull had a bit of creep which I wanted to remove. I used a 400-grit polishing stone and reduced the notch on the hammer to 0.010”. I marked the lip with a blue marker and carefully stoned the lip until the notch was reduced. This was a trial and error process; I reduced the lip by about 10-20 strokes with the stone, then reassembled the gun to test for creep. 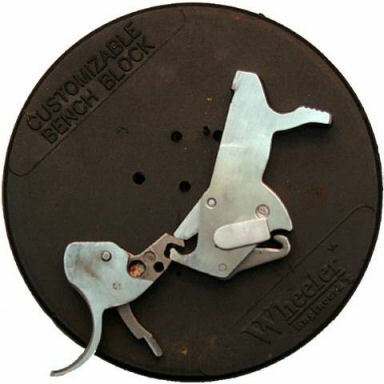 Reducing the notch and replacing the mainspring with a 14# mainspring reduced to single-action pull to 4-pounds, 4-ounces. Next I used a 600-grit polishing stick to polish the bottom of the hammer. This is where the double-action sear rides and needed to be smooth. I used a rubberized polishing tip and my high-speed rotary tool to polish the top and bottom edges of the hammer dog. There are no critical angles here so the power-tool worked great. I made sure the polishing tip was flat against the bearing surfaces. 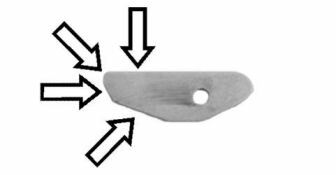 The trigger hooks needed to be polished in the areas shown in the above figure. 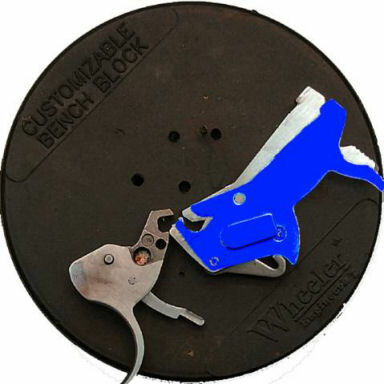 These surfaces make contact with the hammer in both single-action and double-action modes. I didn’t touch the single-action sear because I had already polished this using a proper jig. I purchased a Wolff Redhawk spring kit from MidwayUSA.com #139298 which contained a 12#, 13#, and 14# mainspring. The factory is 19#. Originally I had installed the 12# spring, but that wouldn’t ignite .45 ACP cartridges in double-action mode. I installed the 14# spring which now reliably ignites the .45 ACP cartridges. I lubricated all moving parts with CLP and put Brownells Action Lube Plus #083-050-002 on the single-action sear, hammer notch, and double-action sear and hammer surface. I dry-fired the gun over 100 times to wear-in the parts I just polished; especially the single-action sear. 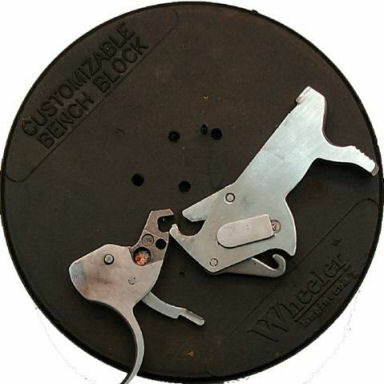 The double-action is smooth and the Ruger design prevents stacking. Stacking is where the trigger pull gets heavier at the end of the double-action cycle. The single-action trigger pull is now crisp with no perceptible creep or drag. It’s still heavy and takes a bit of getting used to, but it is very acceptable and the gun is a pleasure to shoot. Please note that Ruger takes a dim view of performing any modifications to their firearms; especially to the action. If I was to ever have to send the Redhawk in for service, chances are all my polished and/or modified parts would be replaced with factory parts and I would have to start all over.